An array in Python is a collection of similar data type elements. For example, integer array, string array etc. In this article, we will show you, how to create a Python Programming Array, access array elements, iterating array elements, insert new array item, delete array items, clear array elements, reverse array, sort array etc. Unlike other programming languages, Python doesn’t have arrays concept. However, you can use the most powerful lists to create arrays, multidimensional arrays. Following are the list of ways to declare an array. Python provides len function to find the length of an array. In Python, you can use for loop to iterate each and every element in an array. Either you can use an object, or the for loop with range to iterate array elements. In the below example, we declared a string array. Next, we used for loop to display those array items. There are multiple ways to insert new element into an array. In this example, we are using append function to insert new element at the end of an array. In this example, we are using insert function to insert array element. insert function is used to insert an element at a given index position. There are multiple ways to remove element from an array. In this example, we are using remove function to remove items from array. In this example, we are using the pop function to remove array items. Use this pop() function to delete array element at the user-specified index position. You can slice an array using the index positions. Slicing accepts two values, and they are Start and end. The following are the list of array methods available in python language. The copy function is used to shallow copy the array items into a completely new array. 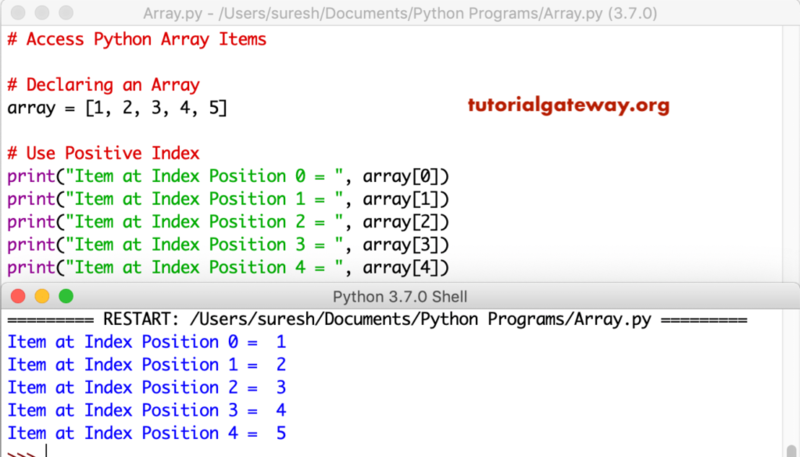 In Python, you can create a multidimensional array by nesting one array inside another array.